We’re just two days away from the December 1 launch of Skyblade’s Gambit, my new novella. There’ll be a preview tomorrow, but today, I wanted to share more information about the project that this novella is part of…after the cut. 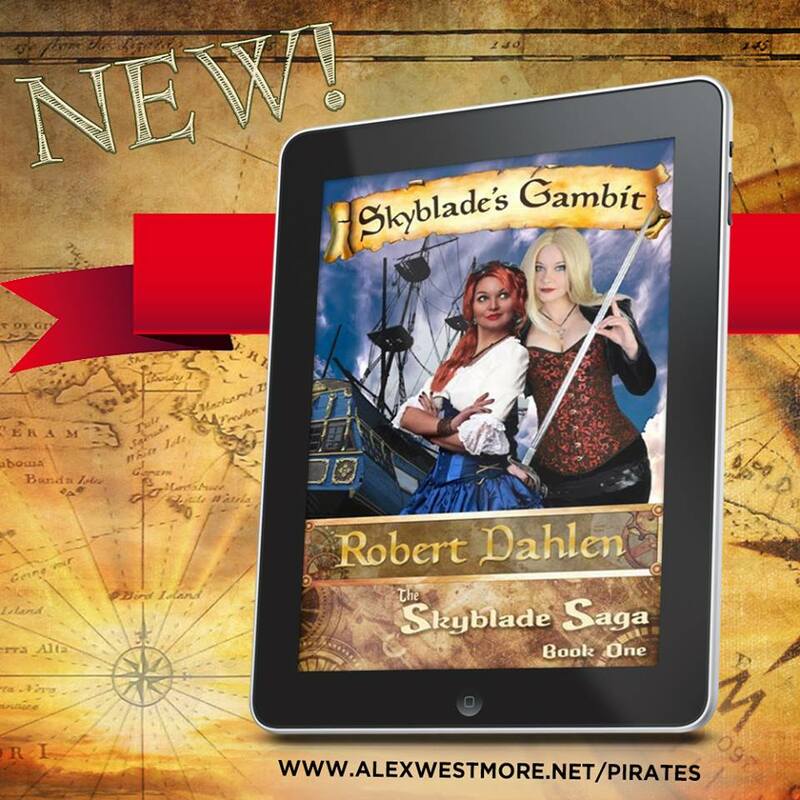 Skyblade’s Gambit is one of eleven new books being launched as part of the Plundered Chronicles, a new Kindle Worlds setting based on the pirate novels of Alex Westmore. If you’re not familiar with Kindle Worlds, it’s a program from Amazon that allows authors to write stories set in various fictional universes. Some that you might recognize are G.I. Joe, Veronica Mars, The 100, the Valiant Comics universe, and…the world of Kurt Vonnegut. Seriously. 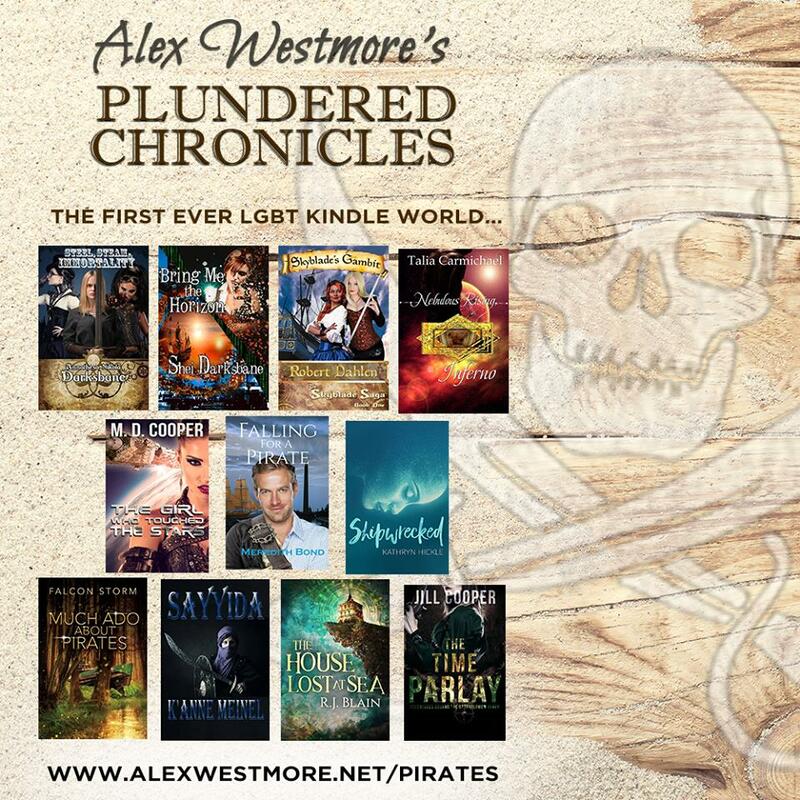 I am thrilled to be offering The Plundered Chronicles as the first LGBT Kindle World, and truly believe this community of brilliant writers has created some amazing stories for you to read. This world couldn’t come at a better time – a time when it is vital our collective voices are heard, when we have the chance to hold hands and remind each other that we and our stories matter. And what stories we have. If you like steampunk, we have it. If you like undersea adventure we have that. If you are a fan of the Plundered Series, we have backstories as well as future plot lines. This is a world where everything is possible and anything is probable. Prepare to suspend your disbelief because this powerhouse of writers is serving up more than a yo, ho, ho, and a bottle of rum. They have worked tirelessly to create original and entertaining stories that will make you laugh, make you cry, make you wonder, and hopefully make you want to be a part of something fantastic. I am honored that these writers took precious time away from their own characters to play with mine in a variety of genres, and set them sailing off into outer space or into the faery realm. I am proud of the hard work each author has put into their plot line and I am very pleased with the fabulous quality of the writing. And thanks for stopping by, matey. I know I speak for all of the writers here when I say we are glad you came and we are confident you will find yourself so immersed in our world, you’ll come back again and again as we create even more diverse stories for your reading pleasure. So welcome to the exciting world of Quinn’s pirate adventure where words are sharper than knives and where bravery and courage are as important as breathing. No matter what genre you enjoy reading our world has something for everyone. So what other books are going to be part of the Plundered Chronicles? I’m glad you asked! If you look real close, you may have seen two familiar names…the team from Darksbane Books! Shei Darksbane tells a cyberpunk dystopian tale, Bring Me The Horizon, and Annathesa Nikola Darksbane spins a steampunk yarn with Steel, Steam And Immortality! There’s also time travel, undersea adventure, science fiction, fantasy…and lots of pirates! You can find out more about the books here. I’m excited about this, and I hope you will be too! See you on Wednesday with the preview!